question_answer1) Why was the operation Desert Stormy fought against Iraq? question_answer2) What is the full form of SAARC? question_answer3) State any one important objective of United Nations. question_answer4) What is meant by 'disarmament'? question_answer5) Mention the main recommendation of the States Reorganization Commission of 1953.
question_answer6) Who was the founder of Bharatiya Jana Sangh? question_answer7) Which two political parties were the major partners in the rulings alliance after the 1971 General Elections to the Lok Sabha? question_answer8) Name the political party which came to power at the Centre in 1977.
question_answer9) Mention the two main demands of the Bharatiya Kisan Union in 1980s. question_answer10) Name the two alliances/fronts that formed the Government at the Centre in 1989 and 1996 respectively. question_answer11) Name any two foreign leaders, along with the countries they belong to, who are recognized as the founders of Non-aligned Movement. question_answer12) What is meant of Shock therapy? question_answer13) Trace the evolution process of European Union. question_answer14) Mention any two functions of World Bank? question_answer15) Highlight any two threats to country's security as per the traditional notion of security. question_answer16) Identify any two consequences of the partition of India in 1947.
question_answer17) Differentiate between the capitalist and the socialist models of development. question_answer18) Highlight the contribution made by Jawaharlal Nehru to the foreign policy of India. question_answer19) What does the special status given to Jammu & Kashmir under Article 370 mean? question_answer20) How does party-based movement differ from non-party movement? question_answer21) Why did the superpowers need smaller states as their allies? Explain any four reasons. Study the cartoon given below and answer the following question. (i) The given cartoon is related to which country? (ii) Which two symbols in the cartoon helped in identifying the country? 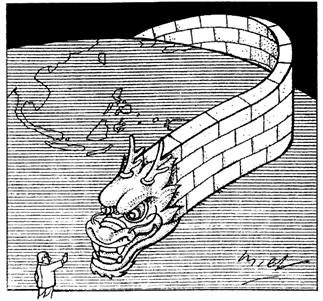 (iii) What message does the cartoon convey to the world? question_answer23) Explain the hegemony of United States of America as a structural power. question_answer24) Explain any four causes of ethnic conflict in Sri Lanka. question_answer25) Explain any four components of India's security strategy. question_answer26) What is globalization? Highlight any three causes, of globalization. question_answer27) Describe the organization of the Congress Party as a social and ideological coalition. question_answer28) Explain Indians nuclear policy. question_answer29) Evaluate the consequences of declaration of emergency in 1975. In the given political map of India, four places are marked as A, B, C, D. Identify them with the help of information given below and write their correct names in the answer book along with their serial numbers and the alphabets concerned. (i) The state related to Chipko Movement. (ii) The state where a special opinion poll was held asking people to decide if they wanted to merge with Maharashtra or remain separate. (iii) The state out of which the states of Meghalaya, Mizoram and Arunachal Pradesh were created. Examine any six consequences of the disintegration of USSR. 'Non-Alignment Movement (NAM) has become irrelevant today.' Do you agree with the statement? Support your answer with any three suitable arguments. Analyze India's stand on any three environmental issues. Assess any three basis on which globalization is being resisted in India. Explain any three reasons for the dominance of Congress Party in the first three general elections in India. 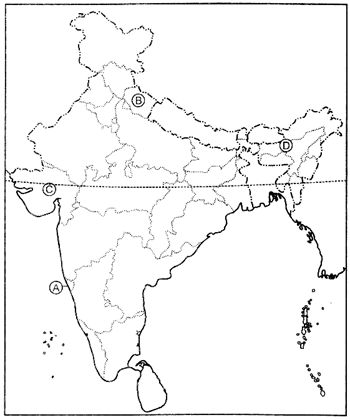 How did the Reorganization of States place in India after its Independence? Explain. Examine any six reasons for the imposition of emergency in India in 1975. Examine the major issues which led to the split of Congress Party in 1969. Sardar Sarovar Project is a multipurpose mega-scale dam. It required relocation of around two and half lakh people from the villages. Issues of the relocation and proper rehabilitations of the project-affected people were first raised by the local activist groups. It was around 1988-89 that the issues crystallized under the banner of the NBA-a loose collective of local voluntary organizations. (i) Why is the Sardar Sarovar Project mentioned as multipurpose mega-scale dam? (ii) Why was it opposed by the villagers? (iii) Name the organizations which led the movement against this project. (iv) What was the main demand of the local activist group? India adopted a democratic approach to the question of diversity. Democracy allows the political expression of regional aspirations and does not look upon them as anti-national. Besides, democratic politics allows parties and groups to address the people on the basis of their regional identity aspirations and their regional problems. (i) Which type of diversity exists in India? (ii) Name any two political parties that represent regional identity. (iii) Mention any one movement that expressed regional aspirations. (iv) How does democracy treat the regional issues and problems.